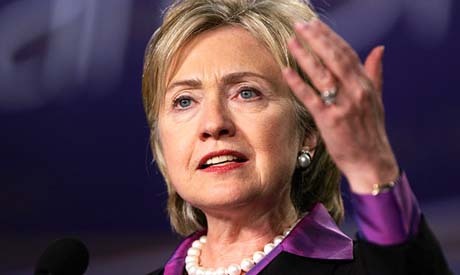 Clinton visits Egypt on Tuesday. U.S. Secretary of State Hillary Clinton visits Egypt today to urge its military rulers to lay the ground for a genuine transition to democracy and offer support to the citizens that toppled Hosni Mubarak from power. The highest U.S. official to visit the country since the February 11 ouster of the former president, who had been a close U.S. ally, Clinton's visit is less a victory lap about the virtues of democracy than a cautionary tale about its challenges. In speeches in recent weeks, the U.S. secretary of state has stressed the difficulties of nurturing the institutions that support democracy, including robust political parties, a free media and the rule of law. In Egypt's case, the task may be all the harder given the vacuum left by Mubarak's 30 years in power in which he crushed dissent, blocked the creation of new parties and ensured that legal opposition parties posed no serious challenge. "Transitions to democracy are fraught. Jobs and economic opportunities do not materialize overnight. Democratic dreams can be dashed by new autocrats or ideologues who use violence or deception to seize power or advance an undemocratic agenda," Clinton said in a speech on Friday. "Elections only work if their results are respected and if they are embedded in a durable democratic framework of strong institutions, the rule of law, a vibrant civil society, and human rights protections for everyone," she added. Asked to summarise Clinton's message, a U.S. official said: "What happens next is as important as what came before. Transitions to democracy are difficult and they don't produce results overnight or end with the first successful election."